Despite the weather being less than favourable the new venue for the Bowes and Bells Meet this year made up for it. Elaine Smith kindly put pen to paper and explained that just because all was not Spring-like light winds and misty mornings a fine time was had by all. As we, the Pennine Region Balloon Association, didn't have a meet any further north than half way up North Yorkshire, we decided that we needed to remedy this. So with a potential area identified and defined as 'somewhere near the A66' we went a-looking for a suitable venue. We thought we had found one and went ahead with our first Bowes and Bells balloon meet in August 2014. Sadly the proprietor moved the goal posts quite considerably on our arrival so we voted with our feet and looked elsewhere for 2015. We looked long and hard for a replacement venue, (looking for somewhere not a million miles from Bowes or we would have to come up with a new name too), trawling maps and the internet to no avail, finally resorting to a virtual 'driving' up and down the lanes in the desired area when we spied a Camping and Caravaning Club sign on a fence down a little lane north of Richmond, could this be the place? A tentative enquiry of the owner, Judith, and a subsequent visit to check out the site in real life and it was all systems go for the second B&B meet. 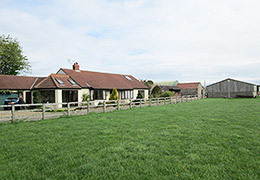 Broaches Farm is a delightful little certificated site, well hidden down narrow lanes (ideal for a balloon trailers/caravans!) but in essence it is not very far from the A66 so very easy to reach. We decided on an April meet and we were not disappointed with the timing as the daffodils and spring bulbs at the farm and the surrounding countryside were just simply spectacular. The meet seemed to be settled into the middle of a lovely bout of spring weather, but as can be the trend with British ballooning, sadly the weather just did not favour our sport this time around but nevertheless we all had a good time. The pilots booked in were Alex Smith with G-OATV, Harry Stringer with G-YUMM, Neil Beckwith with G-ROXI, Graham Cannon and Peter Haworth with G-CHAU, Phil Traviss with G-LEGO, Kevin Graham with G-CGWU, Mike Bellamy with G-BVDB, Ray Wright with G-CIAY and Judy Wetters, Martin Read and Emily Read (Pu/t) with G-COSY. Alongside these intrepid birdmen and women were their loyal crew, good friends and faithful hounds! Naturally there was a Plan B should the weather not play ball and so we duly distributed a 'wordy' quiz for something to do in between moments of playing tennis, visiting spectacular local attractions such as High Force, The River Tees, Barnard Castle's er, castle, Richmond, its castle and the River Swale, Bowes and its museum. Add to this other very local places well worth a visit such as Raby Castle, Rokeby Park, Egglestone Abbey and you soon rrealise that you name it, this beautiful area has it! Two teams scored full marks in the quiz so a well done went to Long John Silver and the Cabin Boy (better known as Phil and Pauline Wilkinson!) and also to Jan Mitchinson. The booby prize (A book entitled 'Step by step guide to ballroom dancing for men'!) went to Mike Bellamy, although at 18 points it was not a shabby effort at all. The area also has some fab eating and watering places - such as the Fox Hall Inn and their award winning fish and chips (....what award did it win......anyone seen the Rhod Gilbert sketch?! ), the Morritt Arms, Cross Lanes, The Rokeby Inn, Mainsgill Farm shop, all in easy travelling distance on the A66, also numerous restaurants in Richmond, even a Burger King at Scotch Corner if you must. 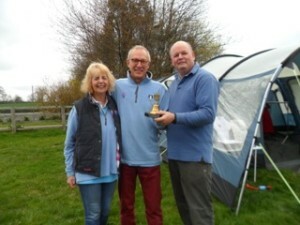 The Bowes and Bells pilots challenge trophy was to be awarded to the pilot who landed closest to a bell, any bell, or indeed something related to a bell. Sundays goodbye meeting loomed with still no flying so creative entries for the challenge were accepted. With two contenders, Team Beckwith for actually taking their little balloon out of the trailer to fit a new parachute and to Team Cannon/Haworth for also allowing their envelope to see the light of day, 'flying' all of two feet from the back of the trailer to the ground and who actually turned the whole thing around and repacked its bag it went to a public vote which went in favour of Team Cannon/Haworth especially when Peter Haworth made it known that he had brought along a huge cow bell (similar to those on a particular type of Austrian chocolate!) to ensure he landed closest to a bell had he flown. Clever! So, even though the weather let us down, the beautiful countryside didn't especially so at Broaches Farm with gorgeous daffodils lining the driveway so much so that the good news is that we are going back next year over the weekend 15-17 April 2016. 'Oop North' is very beautiful, really it is, so come on, venture further north than Leicester Forest East on the M1 and see for yourself! The Pennine region now have a meet every month from now until November, with some lucky months even having two! Check out the Meets page for details or visit the website. If you want to come and join us for any of the meets please feel free, you will be made most welcome wherever you come from!